Accordance Bible Software 10: Essential Collection. Altamonte Springs, FL: OakTree Software, Inc., 2014. So now I’m a Mac user and I wanted to see if Accordance could live up to all the hype I’d been hearing for the better part of the last decade. I contacted the fine folks at Accordance Bible Software and after a series of email exchanges they decided to take a chance on me and let me use their software in exchange for this review. In the interest of full disclosure I’d note that I’ve had the program for less than three months so I haven’t come close to exploring all of its features but I’ve familiarized myself with enough to be able to offer up some preliminary thoughts. This review, then, is a work in progress; probably the first in a series of reviews as I continue to explore and discover what Accordance can do. The first thing to mention is that Accordance 10 is available to run natively on both Mac OS X and Windows (XP & later). This is a welcome development! Accordance users are licensed to install the program on up to 5 machines so I’ve opted to install it on my Retina MacBook Pro running OS X Mavericks; my Toshiba Satellite Pro running Windows Vista; and just for kicks and giggles on Windows 8.1, which I run on the MacBook via Parallels. I have also downloaded the Accordance app to my iPad Air. The installation process was fastest in Mavericks. The Windows 8.1 installation was also quick and easy. No problem on either front. I did, however, have a problem installing the program on my Toshiba running Vista. To be fair, the installation wasn’t the issue, but downloading the Essential Collection once the program was installed gave me fits. I attempted the download several times with no success. I uninstalled and reinstalled Accordance multiple times to no avail. The resource download would freeze up every time. I concluded that my machine was simply not powerful enough to handle the operation and contented myself to simply use it on my MacBook. But I’m persistent by nature so I gave it another shot and it worked the last time! My initial plan was to simply use Accordance on a Mac. It was an added bonus to learn that I’d be able to install it on Windows as well. Using the full program on OS X is indeed infinitely better than the free trial version run on the Basilisk II emulator, but I can honestly say the same about running it natively on Windows! The interface is slightly different between the OS X and Windows versions but the functionality is pretty much the same. 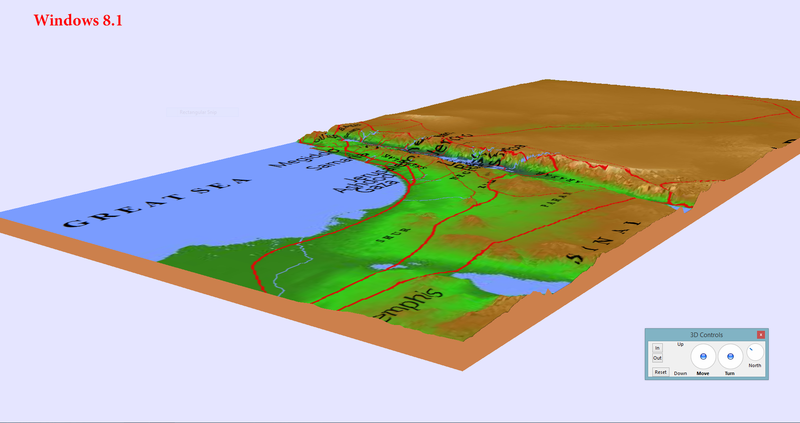 I had read that the 3D Atlas did not work in Windows but this doesn’t seem to be the case; it works just fine although I think the controls are a bit smoother and the maps look a little better in OS X. The non-English translations are sparse but smartly chosen. The 1909 Reina-Valera is the Spanish translation of choice although the 1960 edition would have been preferable. The Geneva Bible Society’s 1951 edition of Franz Eugen Schlachter’s German translation is included, which is nice, but having the Luther Bible available as well would have been better. It is however available to add on as a standalone module or as a part of the International Bibles package. We have the 1994 Nuova Riveduta Italian translation and the 1979 Edition de Genève French translation as options as well. But it’s the primary language texts that likely occupy most of the exegete’s time. We have access to a tagged version of the Biblia Hebraica Leningradensia, which is basically the Biblia Hebraica Stuttgartensia without the critical apparatus. Those doing text critical work in the Hebrew Bible can get a hold of the tagged BHS with apparatus if they really need it. The Rahlfs-Hanhart edition of the Septuagint is included sans apparatus along with an additional LXX module for books that have two separate versions (e.g., portions of Joshua; Judges; Daniel; etc.). And while not a primary text, I’m happy to have the New English Translation of the Septuagint in this package; it’s a marked improvement over Brenton’s translation, which comes stock as well. 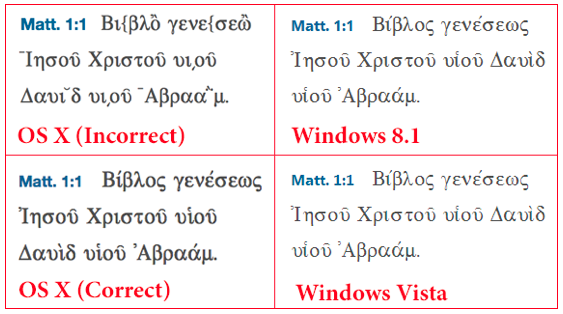 Four editions of the Greek New Testament are available (well, five if you count the Textus Receptus twice since they have a version tagged with Strong’s numbers and one without). Constantin von Tischendorf’s version; B. F. Westcott & F. J. A. Hort’s; and the latest edition of the Nestle-Aland Novum Testamentum Graece (NA28) are all included and morphologically tagged. As with the Hebrew Bible or even the Septuagint, those engaged in textual criticism can purchase the critical apparatuses if need be. I was surprised to that no edition of the Latin Vulgate is included. In a resource heavy collection such as this, this is an odd omission indeed. There are a ton of reference materials to include Bible translation notes, lexicons, grammars, commentaries, and monographs. The parallel collections (Epistles [both Pauline and Catholic]; Gospels; Harmony; Old Testament; OT in NT; Q; Synoptics) are especially helpful And to this we can also add devotional material and nice visual tools like the biblical history Timeline (pictured in part below), which has more features than I can possibly mention, although I will note that it can be set to show the biblical books that correspond to a particular time period, or even viewed according to “critical” and “conservative” dates. 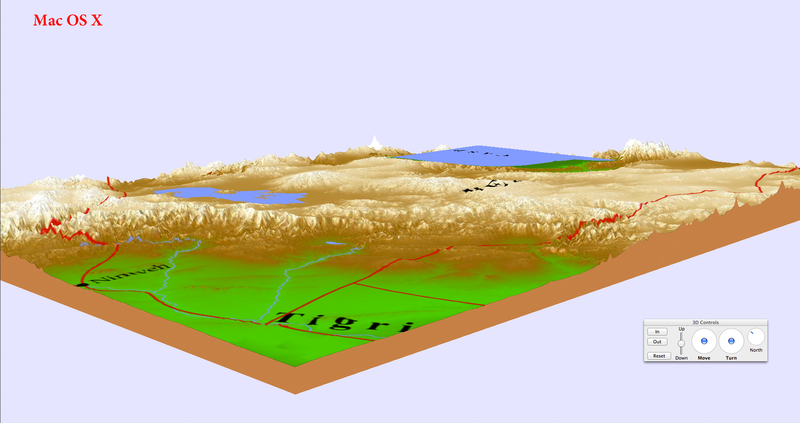 The 3D Atlas (pictured above) is quite useful and comes with a number of visual filters to enhance the viewing experience. All of these resources leave the user in a great position to do solid sermon or lesson prep. But what’s better than simply having so many resources at your fingertips is the variety of ways that you can customize Accordance to your specifications in order to make use of them. The user is able to do this by creating various workspaces that can be saved and recalled for use at will. The benefits of this feature are immeasurable. If I’m doing some research in the Old Testament I can open my Old Testament workspace and make use of the Hebrew Bible, the Septuagint, a couple of English translations, some Hebrew & Greek lexicons and pretty much any other resources I have at my disposal. But if my research shifts to the New Testament or Deuterocanon (aka Apocrypha) then I don’t have to reconfigure my Old Testament workspace; I can simply switch to the workspaces I’ve already set up. One of the great benefits of using Accordance on a MacBook Pro is that I can have multiple workspaces opened and switch between them with a simple trackpad gesture (swiping left or right with three fingers). Mac Pro and iMac users can do the same with a Bluetooth Apple Magic Trackpad (which I am currently using with my MacBook Pro in clamshell mode). Aside from seemingly infinite workspace flexibility, Accordance is fast and powerful. It starts up in a matter of seconds and once opened its able to run even the most complicated searches in fractions of a second. Once searches are returned the user can then view a number of different statistical analyses, to include bar, pie, and table charts; hits graphs; an analysis of how many times a particular word is used and in which contexts; and more! There is more information available than most users will ever need, and I might add that most of these features have additional features built into them! Another wonderful feature I’ve toyed with a bit is the diagramming. Below you’ll see a brief video of diagramming in action (the text is Luke 1:6), which upon playing with the program more extensively I’ve learned could have been done differently (and to my mind better and more efficiently). Nevertheless, however one goes about creating their diagrams, this is a great tool for discourse analysis and following the flow of the text. Aside from the collection download issue, which I still haven’t been able to account for, I had a technical issue with the way that Greek text was displaying in OS X. You can see from the comparison below that the text displayed correctly in Windows Vista and 8.1 but not in OS X. I contacted technical support with an email and was met with a speedy response. I followed the instructions without success and after a couple of emails the tech asked if I was available for a Skype call where we could do a screen share. Unfortunately we weren’t able to make that happen but after mentioning the problem on Twitter I was given two suggestions from an Accordance representative. The first was to download the font fixer. I had tried that already and it didn’t work. The other was to delete the Helena font, which worked beautifully! As I mentioned earlier, I have the Accordance app downloaded to my iPad Air, and if I’m honest, I’m not a huge fan. There’s nothing really special about it as it seems quite plain. It’s also not very intuitive. As it stands I find myself always turning to Logos’ mobile app over and against any other option. Not much more to say on this front. Perhaps with time and more use I’ll come to appreciate the iPad app more than I do presently, but it’s going to be tough to find the desire to continue to use it. No worries though, I tend to use my tablets for reading the Bible more than for doing advanced study. The last thing I’d like to comment on is Accordance’s various means of guided instruction. Their Webinar Archive contains a number of training sessions where instructors show users how to use Accordance to its full potential. I haven’t been able to watch any of these sessions in full but I’ve glanced at no less than three of them and they’ve all been extremely helpful. I’m looking forward to watching them all and really getting the hang of some of the more technical and tricky aspects of the software. There is also the “Lighting the Lamp” podcast, which is really just a bunch of miniature webinars. They also do free training seminars around the country throughout the year. All in all, Accordance wants its users to be informed, and they’re doing everything possible to make sure that happens. Is Accordance 10 the most powerful Bible study software on the market? I’m not the one to answer that but I can say that it’s more powerful than anything anyone will ever need. Just about everything that Accordance does, it does extremely well. Dropping hundreds of dollars on any program can be daunting, but you really get your money’s worth with the Accordance 10 Essential Collection. If I had one complaint it would be that users are not given a custom install option where they can select which resources in particular they’d like and which ones they wouldn’t. As it stands, I have more resources than I need, and a good many will never get used. But this is really just a case of there being an embarrassment of riches. Great review! You’ve done your homework. Nicely done. 1. I think the installation/download issues you had could have been a result of the server issues Accordance was having over the last couple weeks. I believe these are now since fixed. It’s the first time since I started using Accordance almost two years ago that I can recall that being an issue. 2. Have you checked out the forums? Lots of good help there. 3. Have you tried to Save As Session? I use that all the time—it’s an area where even Logos’s complexity doesn’t match Accordance’s. You can save a 5-workspace session, for example, so that when you open the session, you get all those workspaces you put in it. You probably have already figured this out, though! 4. There is talk on the forums (has been for a long time) about “arbitrary text selection” on iOS, which would finally enable more precise highlighting, copying, etc. I’m looking forward to this addition. 5. Re: “more powerful than anything anyone will ever need”—you’d be surprised! :) Some pretty amazing power users frequent the forums. Integrate with scripts, do batch searches, etc. Thanks for the review! I enjoyed reading it. Looking forward to seeing more. Abram: 1. Thanks for pointing out the server issues. That was truly a mystery to me! 2. When I was having the issue with the Greek text displaying incorrectly I scoured the forums and couldn’t find that anyone had had the same issue. But I plan to make regular trips there as questions arise. 3. I have tried the Save As session on my Toshiba. On my MacBook it hasn’t been necessary, or so it seems. When I open Accordance all of the workspaces I had open (and didn’t close individually when closing out of the program) the last time I used it pop up. 4. I’ll keep my eye out for the iOS improvements. Thanks for the note. 5. Wow! I couldn’t imagine pushing this program to its limits! And thanks for your reviews! They factored into my requesting a review copy. Sure thing! Glad you liked the reviews and had a chance to do it yourself. Nick, you mention that your typical iPad usage is just simple Bible reading. Would you care to comment in more detail about what exactly in the Accordance app does not bode well in this regard? Comments like “quite plain” and “not intuitive” are pretty non-descriptive and won’t help us to improve the app and functionality. Feel free to post it to our user forums as well if you’d like; we read all feedback and feature requests received there. Rick: I *generally* just use my mobile apps for reading the Bible but certain times call for a bit more (like checking something on the fly in a Bible study). I don’t doubt the app’s ability so much as my own. By “not intuitive” I mean that it took me quite a while to figure out the elementary matters like downloading my resources. I was confused to go to my library and see sample Bibles in there. I toiled for the better part of an evening until I figured out that I had to download individual resources to the app. Perhaps equipping the app with a tutorial upon installation would help with the basics. As I said in the review, it’ll take more time and hands on use to make me appreciate it more. But the initial experience, which I admit is uniquely my own, was a letdown. This isn’t to suggest that others will necessarily have the same issues. As for module installation, I’m sorry you struggled with this. Did you think to check the Help (either in the iOS or Mac app)? There are detailed instructions on how to use Easy Install, or Sync with Desktop (the fastest and preferred option) including screenshots. See here (Mac help) or here (iOS help). Yesterday when I read your review, I had just gotten off a 4 hour GoTo Meeting with our Mobile Working Group where we discussed our next major release and future updates. We’re also eager to hear feedback from new users. That’s why I asked you to clarify. I would encourage you to spend some more time in the app, especially if you are going to use the Mac app more. The ability to sync highlights and notes is great for general Bible study. You can also perform very fast and sophisticated searches on original language texts. We’ve got a long way to get the app where we want, but I think you’ll find it’s pretty feature rich. Feedback is always welcome on our User Forums; every post is read (even if not replied to). Thanks again for the review. Glad you finally made it to Accordance after all these years. I spent lots of money in a previous life on Logos. Then I became a Mac user and for years they kept promising that “a Mac version is coming soon.” In the meantime I got Accordance and was amazed at its speed and overall excellence. It fits the Mac like a glove. Then, once Logos came along for Mac, I installed it and was thoroughly underwhelmed. It’s not that it was that different than before, except I had now become used to Accordance and Logos felt (and still feels) clunky on the Mac. Logos is like a giant old library where you have to use a card catalogue, walk down long halls and possibly even search around in the right location before you find what you need. It’s the only place where you will find some things, but it takes effort to get to them. Accordance is like your personal bookshelf. You keep those essential academic resources, but they are well worn in and you can find what you need really quickly and comfortably. I can imagine that if I were a pastor who needed a giant library to sift through for illustrations and multiple comments on the text then Logos might be more helpful, but that’s not what I need. I spend most of my academic research time in specific primary sources of various languages doing complex linguistic searches. Since this is the case, Accordance blows the other options out of the water. Kyle: That analogy is perfect! The fact of the matter is that Logos can do pretty much everything that Accordance or BibleWorks can do. It just can’t do it as quickly or as easily. I agree that they can all do pretty much the same tasks. One may be faster, but in the end, which is preferred becomes the personal question. I use them all, but prefer Accordance. However, they all hold different libraries for me, so I enjoy them all together. Johnny: I have all three programs on both my Windows laptop and my MacBook Pro but I tend to use BibleWorks on the Windows machine, Accordance on the Mac, and Logos on my phone, Kindle Fire HD, and iPad. I think Logos’ mobile application is by far the best. Also, I have the most books in Logos, so if I just want to read then it makes the most sense to do it on a mobile device.